There is an interesting cross section of opinion on “The Biggest Loser” in “fitness circles”. (Notice the quotes around fitness circles. I really mean more like blogs and things like that I’ve read from people who say that they are involved in fitness circles one way or another. Don’t ask for specifics. I don’t have any at the moment.) Some people think that the show is really not a good thing. They say that it creates a very specific scenario that is nearly impossible to recreate in the real world, and that this could lead to some of the people that the show is trying to inspire to feel bad about their lack of comparable progress, which would play right into the state of mind that got them where they are. There is talk about the focus on “big number” weight loss as opposed to body-fat percentage loss. Also, some of the techniques used on the show have led to some talk over exercise form and program design and things like that. My opinion is that anything that shows people working out, losing weight and changing bad habits in their lives can’t be too much of a bad thing. Harping on form or program design is silly because we are seeing one or two reps out of a workout that could last somewhere between 30-60 minutes, maybe, and we really don’t have much of an idea about their overall program design. Complaining about the focus on weight loss as opposed to fat-loss just isn’t being realistic as to what people look for. I think it’s a good thing that they show how hard people need to work to improve their health and the results that can come from that work and the show generally gives pretty good general health and diet tips. Even as someone who really enjoys working out and going to the gym, I get inspired seeing people work hard to become fit and healthy. Anyway, last week the show did something that I found astounding. For their weekly challenge they had on the author of “Eat This, Not That” (a pretty good book, btw) and they had to pick one of two meals based on which one was the healthier choice. This sounded like a good idea to me. A lot of people don’t realize some basic things about eating out. Things like the amount of calories and fat in certain salad dressings or how many wasted calories in a Coke or how many calories in the pre-dinner bread and butter basket. 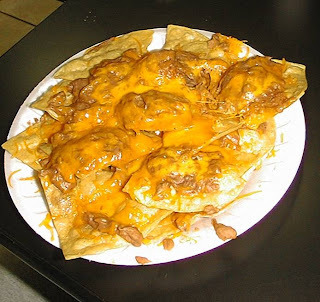 Anyway, the first choice was between a hot dog with ketchup, mustard and relish or nachos with cheese. Which of these choices is at all healthy? 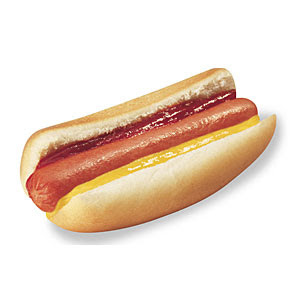 Yes, the hot dog is healthier, but this in no way represents a healthy choice. Which one will make me thin? The second choice was the only one that seemed to actually represent a legitimate choice: Spaghetti with marinara sauce with sausage and a side Caesar salad or penne with shrimp, marinara sauce and a side garden salad with fat-free Italian Dressing. The penne without the sausage and fatty Caesar dressing won. The other choices included Chicken & Shrimp Fajitas with the works or 24 Chicken Nuggets with barbecue sauce (the nuggets won), and Grilled chicken burrito with the works or 18 lite beers (the burrito won, barely). Wow! What should I have for lunch? A burrito or 18 beers? The topper there was that they said that if it was 17 beers it would actually have less calories. What kind of choices are these? Can a 24 piece chicken nugget pack ever be considered a good food choice? I don’t know, maybe I’m nitpicking a little but it seems to me that when you have the chance to spread some good info instead of bad info you should do it. Tell people to eat fruits and vegetables. Don’t give them the impression that chicken nuggets and hot dogs are the kinds of foods that will help you with your goals. Oh well. This is just my opinion. It doesn’t mean much.